Smoking time: 1 Hour 20 Min. Construction: I have been struggling to keep this cigar in my humidor the past few days, but it was the cigar of choice for #cigarchat this week and I just had to wait. 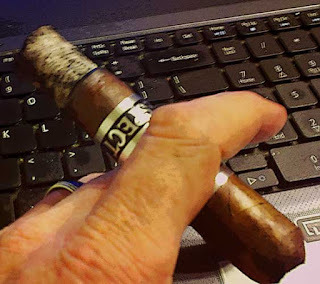 With Jay and Tom from AKA Cigar joining in on the chat, the wait was over. This stick had beautiful dark brown habano wrapper. The wrapper had a nice oily looking sheen and was virtually free from veins. Let me tell you this was one impressive looking cigar. Pre-light: Putting this cigar to my nose was a rewarding experience. The aroma radiating from the wrapper was a very pleasant mocha aroma, the foot was nearly the same but had a nice amount of tobacco mixed in. Clipping the end I was rewarded with a nearly perfect and nice mix of mocha and tobacco. I was a bit disappointed that the wrapper did not have the flavor i was expecting as it seemed nearly tasteless. First third: Once the cigar was lit it produced a large volume of smoke and the first flavor that hit my pallet was the nice full bodied mocha flavor that matched the aroma from the wrapper. The burn was right on and left behind a firm light gray ash. Middle: I left the ash on until right at the mid point where I chickened out and bumped it off. By this time the burn had taken off a bit, but was not a problem and I was still enjoying that nice mocha flavor. Once the burn was a bit past the mid point a nice note of smooth earthiness joined the mocha. About now I was thinking this cigar was going to finish with my favorite flavor mix of scalded mocha, but I was wrong. End: Right at the beginning of the final third the flavor mix shifted drastically and it actually stumped me for a few puffs. As I smoked on, the best flavor I could associate with the taste was fruit. I was shocked that it had changed that drasticly, but it was a very nice flavor mix that sat on the pallet for quite a while between puffs. Buy now the burn was off even a bit more but the cigar was still smoking just fine. At about the final one inch mark and large amount of earth and oak entered into the flavor mix giving this cigar a very unexpected but nice finish. Overall: Hands down, this was probably the best tasting cigar I have ever smoked. The complex flavor profile kept me guessing through the last half and I found the stick to have absolutely no harsh pepper that comes with most robust cigars. 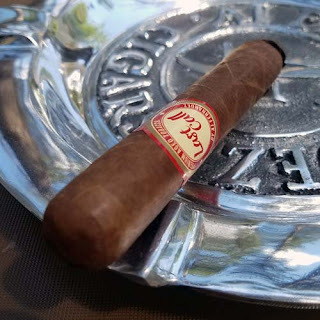 I was a bit disappointed that the wrapper never did develop near the flavor I was expecting from such a nice oily wrapper, but the flavor the cigar produced more than made up for it. The only other issue was the burn which never did get so bad that it had to be corrected. This was a very nice cigar and if you are looking for one that is bold but light on pepper this would be the stick for you. I will be buying more of these. Construction: As I unwrapped this toro my first though was "wow, this isn't a cigar, it's a baseball bat"! This stick was simply a beast of a cigar. Taking a close look, the overall construction was nearly perfect, the wrapper contained a couple fine veins, there were no soft or hard spots the entire length. It was just one well put together cigar. Pre-light: Putting the cigar to my nose was a joy, the wrapper had a nice mocha scent as did the foot, only stronger. Tasting the end cap was a bit disappointing as I expected such a nice smelling wrapper to have a nice mocha taste, which it did not. It was actually nearly tasteless. As the flame jumped from my lighter to the cigar huge plumes of smoke roared from each end filling the room with a nice white cloud. I think this stick produced the most smoke of anything I have smoked and the initial scent was of woody tobacco. First third: With the first two puffs the immediate flavor was nearly pure pepper, but then it was gone only to be replaced by notes of toasted nuts and nutty chocolate mocha. As I smoked through the first third all I could thing about was how tasty this cigar is but at the same time the flavorless wrapper was still bothering me. As I smoked farther the burn crept off to one side just at bit and it was leaving behind a tight light grey ash. Middle: As the burn neared the mid point a spash of back-of-the-tongue pepper appeared but then very quickly faded leaving the orginal flavor profile with a bit of earthiness added in. I have read a few cigar reviews that used "barn yard" as an aroma. Since I have been around farms most of my life I didn't understand exactly what they meant, until now. The aroma profile had changed from that nice woody tobacco mix to smelling just like the scent radiating from a barn yard. At this point the burn was still off just a bit but it was smoking just fine and the flavor was truly a treat. End: Coming down the stretch every thing was still going along very nicely. The strength had built from what I would say was medium to a nice full bodied cigar as the earthiness continued to build and giving me the flavor that I like so much from maduro's scalded mocha. But at about the 2 inch remaining mark, this cigar went South and it did it rather quickly. The wrapper spilt, then about a minute later the binder split along with it causing me to dump the rest of a fantastic cigar. Overall: Except for the last two inches this had been on of the best if not the best cigar I had ever smoked. I think the flavor matches the Ave Maria Reconquista very closely, but it is stronger and the flavor is even a bit better than the Man O' War Armada. Throwing the last two inches away was a huge disappointment but I do have two more in the humidor to enjoy another day. I have been talking about needing some type of ratings so I am starting one with this new blog.